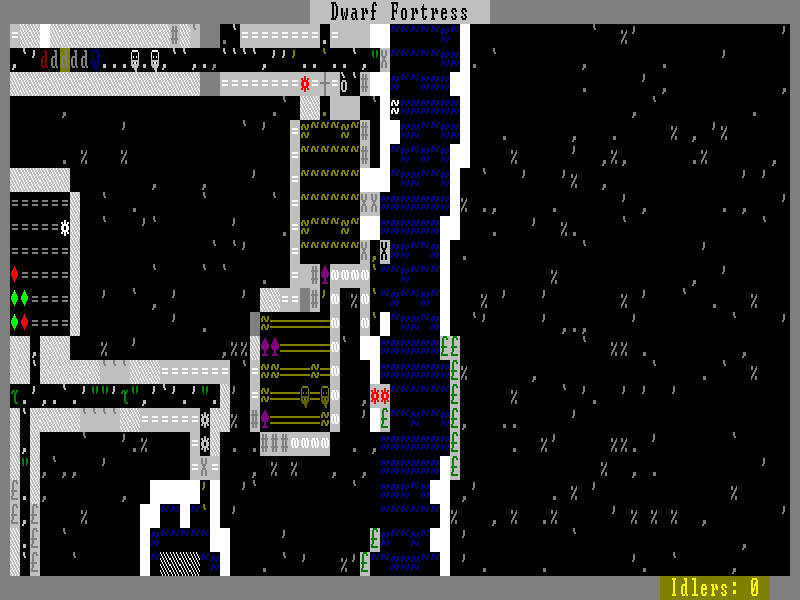 Recently, Bill Harris of Dubious Quality has been raving about a game called Dwarf Fortress. And let me be clear, when I say “raving” I don’t mean “saying nice things about it” but actual raving. Like, he saves the game to CDs, gets naked, and rubs them all over his body. Bill doesn’t just like Dwarf Fortress, he has gone completely around the bend over it. So of course, I had to check it out. Now, I like Bill just as much as bagels like lox, but he’s overselling the game. Or rather, he’s overlooking its flaws because he is blinded by its brilliant parts. This happens to all of us, from time to time. For example, I myself felt very strongly that The Lost Admiral Returns was the best game of 2004 by a mile. Unfortunately, I was also the only person in the entire world who bought it. I understood why: the interface was a bit clunky, and the graphical trim hadn’t been smoothed down quite enough. We can talk about gameplay over graphics all we want, but the truth is that rough edges raise the barrier to entry of a game. Dwarf Fortress has a lot to recommend it. It also has a lot of rough edges. In fact, my first impression when I started the game was “Is this some sort of joke?” The game’s full title is “Slaves To Armonk: God of Blood Chapter II: Dwarf Fortress,” which is just a little too close for comfort to Bladehunt: DeathSpank 2: The Revenge. The game begins with a 30 second cinematic, multiple-scene ASCII-art animation, of a sort that I haven’t seen for 15 years or more (view it yourself here). What the hell? It’s a joke, right? It has to be a joke. It’s not a joke. The game has the look of a roguelike. But it isn’t a roguelike. The closest I can come to describe it is to say that it’s like Age of Empires with text-style graphics from Nethack. But in many ways, it’s better. For quite a while now I’ve hated that gamers have settled on the term “real- time strategy” to describe games like Warcraft and Age of Empires. Strategy is about making large-scale decisions that affect events, usually through logistics. Almost by definition, any game where you say “Lugdush, go chop that tree over there” or “Lugdush, go bash Frank on the head with an axe” are not strategic. Dwarf Fortress comes closer to the strategic ideal, although there is still micromanagement in the early part of the game. So, let’s talk about the good parts. We’ll start with the setup: you have a party of a small number of dwarves who are setting off to find their fortunes. 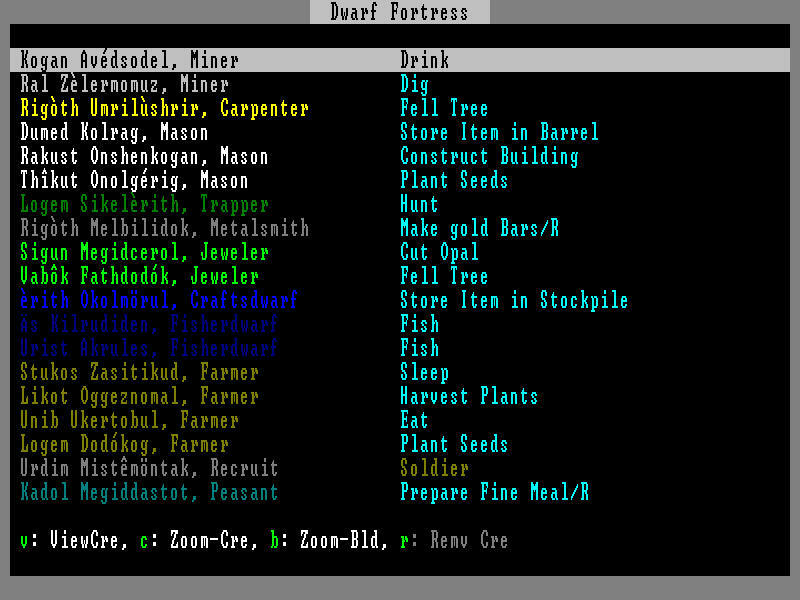 You choose what skills your dwarves will have (the skill list is incredibly long, ranging from mining, carpentry, farming, down to details such as lye and potash production). You pick what supplies you are going to take with you. And then, you pick a wealthy-looking mountain, and prepare to build a settlement. You don’t directly move dwarves around or tell them what to do. There are two main ways you influence what happens. First, you can tell dwarves what sorts of work they should be doing. So you can tell your metalsmith, for example, that he should also be willing to help out with the farming or hauling trees. Then, you designate areas where work can happen. So you say things like “This area over here is for cutting trees. The garbage dump is here outside the cave. I want to build a mineshaft going this way for 30 squares, and then carve out three 6x6 rooms here. Store your food in the first room, build a masonry and carpentry shop in the second, and we’ll put some beds in the third. Then, you just sit back and watch. The priorities you set create a pool of jobs, which the dwarves try to fulfill if they are within their brief. Dwarves that perform jobs gain experience, and become better at them over time; they can change professions. The strategic challenge of the game is that at any given time there are more jobs than their are dwarves, and they’re all important. Most people’s first game ends in all the dwarves starving to death sometime in the deep midwinter. The most interesting part of the game is watching your dwarves decide what to do, and I say that as someone who absolutely despises the Sims. The dwarves are just incompetent enough to keep things interesting, but generally are not so irrational that you want to strangle them. Unless they get sad, or go insane. Dwarves have wants and needs – food, shelter, fulfilling work, alcohol, and companionship – and a sad dwarf with an axe is someone to stay away from. Your initial challenge is to survive. That means figuring out a way to get enough food to make it through winters, which means learning how to farm (and, most likely, build an irrigation system and create fertilizer). It means finding a source of fuel. It means learning how to mine ore and smelt it into metal, and working that metal into weapons, and working stones and metal into crafts which can be traded to occasional travelling caravans for food and cloth. It means fighting off wild animals from outside your mountain demesne and fighting off horrible creatures from deep within the heart of the mountain. It means preventing your own people from starving, or becoming so morose they commit murder and mayhem. There are a few drawbacks to Dwarf Fortress. The game is currently described as an alpha test, so some or all of these may be fixed by the time you try it. But if you try it today – and you should – you’ll need to go in with your eyes open about these issues. One drawback is that at present it is a Windows-only game, although the author is currently looking for some assistance to port it to SDL, so there is hope for a Mac and Linux port down the road. A more serious problem is the user interface, which is ad-hoc in the extreme, and somewhat tragic. Just to take one example, the game uses three completely different sets of keys to mean “next choice” and “previous choice” on menus, depending on which menu you’re on, using some heuristic I don’t actually understand. Likewise, at various points in the game you have to size regions. Sometimes you do this by setting a mark and region at two corners of an area, using the arrow keys to move a cursor and “enter” to mark. Other times (for example, when building a bridge) you use a completely different set of keys to specify the length and width of the area covered. And then sometimes you use a third set of keys to define a diamond-shaped radius around an object. I’m sure there are rationales for all this interface, but I don’t think they were worth the trade off. The in-game help is minimal. At one point, I hit the magic key that made the on-screen cheat sheet disappear, and I haven’t been able to get it back since. Fortunately, there’s a wiki devoted to the game that helps fill in a lot of the gaps. Is Dwarf Fortress, as Bill Harris claims, a paradigm-changing game? Will it disrupt the game industry and bring about a new Golden Age? Absolutely not. I think, to be blunt, that Bill has simply been playing so much Madden lately that he’s forgotten exactly how good a computer game can be when it’s not designed by committee. What makes Dwarf Fortress worthwhile are its quirks, which come from it being the product of one person. Despite the fact that it won’t change the industry, it doesn’t need to. I stayed up until 3 in the morning on Saturday night, literally unable to put the computer down, because I had to continue to help this little microcosm develop. It’s been a long time since any game has kept me up until 3 in the morning. Not everyone will have the stamina to get past the interface and appearance of Dwarf Fortress and give it a serious go. But those who do will be rewarded with a game that has depth beyond their most optimistic expectations. Dwarf Fortress is availble – for free – from Bay 12 Games.